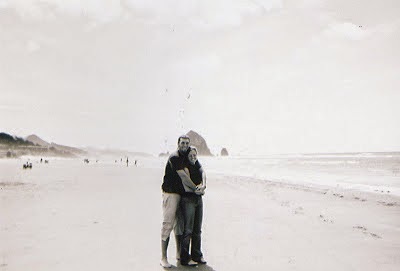 See this cute couple snuggling on the Goonies beach? They were only 2 years into their 7+ years of infertility. They had quite the road ahead of them and couldn’t have made it out to the other side without their community. But it also wasn’t without the deflecting of hearing the wrong things on the regular. Here’s a cheat sheet for those of you with friends on that same journey. Hope it helps. 1. “Oh my gosh, this pregnancy was a total surprise! Can you believe it? We totally weren’t even trying!” (other variations include: “every time he looks at me we get pregnant!”)This might be the worst one. I know that I know that I know that you’re trying to say “I didn’t do it on purpose, I didn’t get your dream before you on purpose” but that’s not what we hear. We hear “Why is this so hard for you? it’s really not that hard.”What to say instead: “Yep, we’re pregnant! Due in ____. How are you guys doing?” Move along. Nothing to see here, folks. For the majority of women I know who struggle with infertility, other people’s baby showers are the worst. The worst. It’s not that we’re not happy for you, it’s the extreme isolation that comes from those events. It’s impossible to compartmentalize our trauma. Even though we’re no longer in the thick of it, I still try to avoid them. That may seem harsh but it’s one of the worst triggers. Even after we adopted Eliot, I thought “I’m a mom now, I can handle baby showers!” but no. So uncomfortable with all the conversations about birthing plans and breastfeeding and how pregnancy affects your body. I just kinda check out. Finding out someone (that you’re somewhat close to) is pregnant in a big group announcement is rough. We can’t hide our reaction. There were times I was legitimately happy for a friend but that happened to be the day we found out we *weren’t* pregnant. There’s no way to hide that. I never wanted to take away from their joy of that moment. We’re never mad at you for getting pregnant. We’re suffering and struggling with our own pain. What to do instead: Opinions vary on this but I always told friends that an email was the best way to tell me. An email before the public announcement. That gives me space to receive the news and compose myself in private so I can join in the joy when the public moment happens. You rarely know where the friend is in their fertility steps and springing the news on them can often fall during a rough patch. Um…no. That’s 100% not true. You don’t know what you’re talking about. You probably don’t know what else to say so you’re just trying to make it better. A bandaid to make the bleeding stop even though the wound calls for something so much stronger. That’s really not comforting. I know you’re frustrated with your kids, that’s the nature of them. Maybe vent to another mom about that, not someone spending all their money, time, emotions and strength desperately trying to even just get one. Downplaying the joys of motherhood for you doesn’t take away the extreme desire to experience it for us. Again, no. Not everyone should adopt. NOT EVERYONE SHOULD ADOPT. That’s another post for a different day, just know it’s not the answer to everyone’s infertility problems. Adoption is complex and too many couples get into it as the solution to their problems. It makes the adoption about them, not about the child. The years of hard work trying to get pregnant can create a sense of entitlement once the adoption process starts. It’s not healthy for anyone involved. We struggled with it and seen so many other couples struggle with it. What to say instead: “I’m so sorry this is all happening. What can I do for you?” Stop solving. Start listening. Every doctor visit, every month charted, every shot given, pill taken, our soul gets more deeply invested in becoming pregnant. Every month it doesn’t happen feels hopeless. It is a constant roller coaster of deep feelings. This comment seems comforting, seems to offer perspective but really it’s just dismissive of the legitimate pain we’re experiencing. If we buy into that? Guess what happens every birthday that passes? Some people don’t get it, don’t get social cues, etc. But most of these honestly came from people who truly care for us and just want to help. I don’t fault them for their intent. No one ever intended to cause pain. Hence, the reason for the post. Hopefully educating and preventing further use of these common responses.